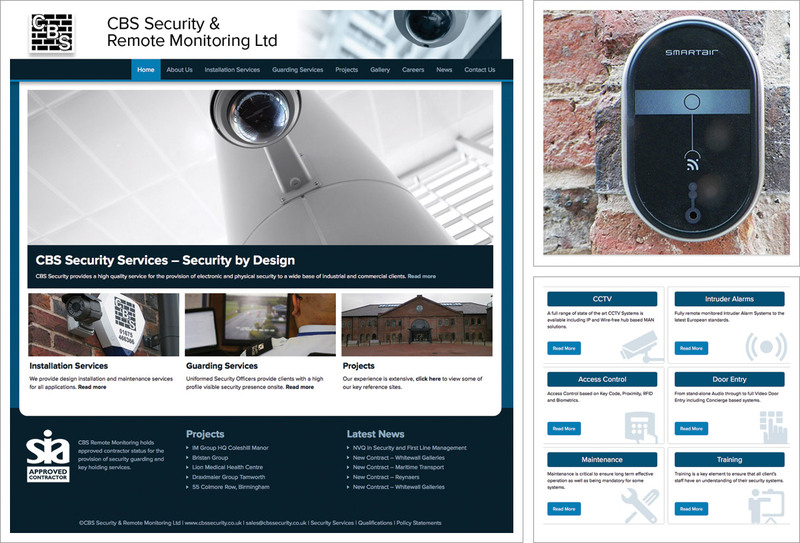 A new website for CBS Security incorporating both new and existing content. CBS Security & Remote Monitoring Ltd provide high quality security services to a wide base of industrial and commercial clients including electronic and physical security installations but also security personnel for concierge and manned guarding. CBS wanted to update their existing website and have the facility to make updates themselves to report on latest news and projects. CBS opted for a responsive / mobile friendly design which means the website displays well on mobile devices as well as desktops. We used their already established business logo and fulfilled the brief of delivering a professional, on-message website that is easy to use. Functionality includes responsive design, secure online contact form, Google map, Lightbox image gallery, a content management system which means the website owner may edit the site and add new content, blog functionality, dynamic changing image holder and downloadable documentation. Good on-page search engine optimisation techniques observed. Web hosting provided by Pedleyonline.